The last decade has witnessed significant progress in the field of upper limb prosthetics. A deeper understanding of basic scientific questions in neurophysiology and neuroscience met novel surgical techniques and prosthetic components, such as articulated hands and myo-controllers that reached the market . However, although myoelectric prostheses have increased dexterity and anthropomorphism, the control interface, namely surface electromyography (sEMG), has remained basically unchanged in the last four decades [2–4]. This interface entails applying electrodes on the skin of the amputee’s stump to capture the electrical activity of residual muscles (myoelectric signal) and translate it into movements of the prosthesis . Amputees therefore must learn to contract their residual muscles to control prosthetic devices. 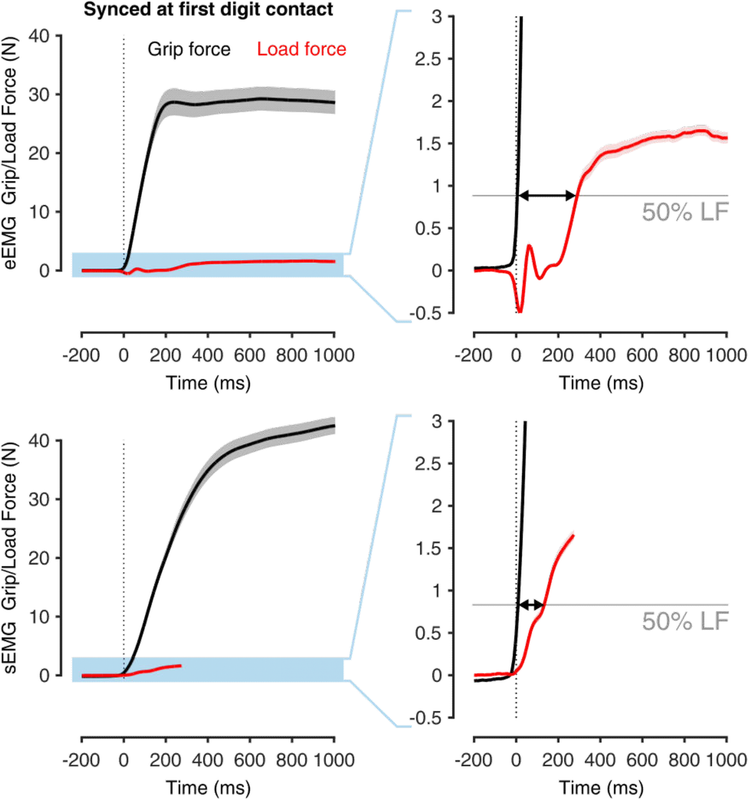 This control approach is effective due to its simplicity but, unfortunately, the limited stability of signals recorded over the skin curtails its reliability. 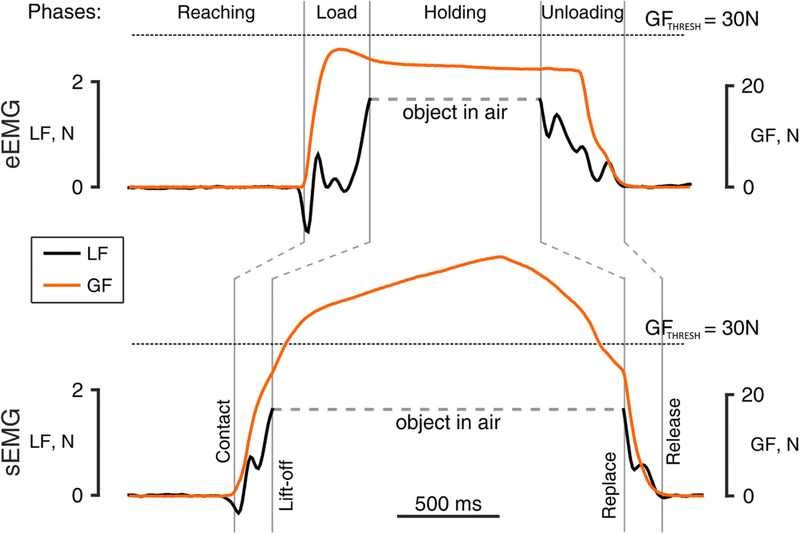 Factors such as temperature, electromagnetic interference, body impedance changes, and motion artefacts can have a destructive effect on the reliability of sEMG-based prosthetic devices. Implanted myoelectric electrodes are candidates for solving this issue, developed on the principle that a more intimate connection with the information source allows for collection of volitional signals in a more selective and reliable fashion [6–8]. Since the 1970s, several groups have demonstrated and clinically assessed various technological approaches, including intramuscular and epimysial electrodes [9–11]. Whereas the differences between implantable and sEMG electrodes have been investigated in terms of signal to noise ratio, selectivity, and stability , only a few studies compared them from the perspective of an interface for prosthetic control [11–13]. Notably, none explored their effects on functional tasks. In this study we endeavored to bridge this gap. Sensory feedback is believed crucial to building and continuously maintaining a functioning motor control repertoire in humans [16–18]. In this study, subjects had at their disposal sensory feedback in the form of vision and osseoperception (mediated by both hearing and touch) . Despite the lack of somatosensory feedback other than osseoperception, we deemed that the available task-relevant incidental feedback would suffice to restore near-natural motor control skills. Saunders et al. and Hermsdörfer et al. 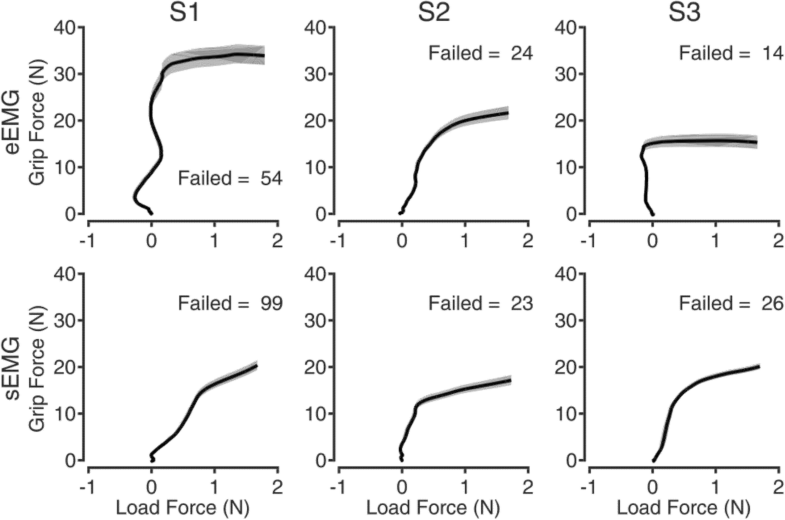 found that when highly reliable efferent signals are available for control, incomplete afferent information may be still enough to retain the motor control library. 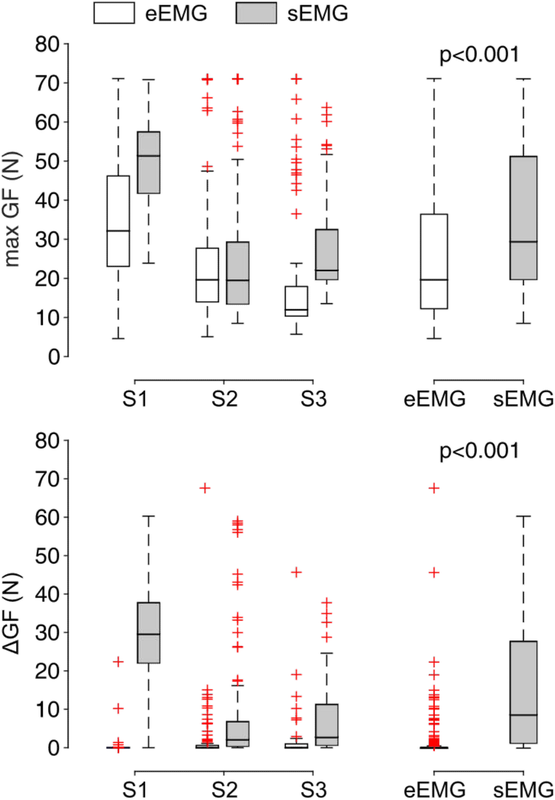 Hence, assuming a superior controllability offered by the epimysial electrodes, we hypothesized that the eEMG controller would entail better (i) grip force control, (ii) reliability, and (iii) motor coordination than the sEMG.